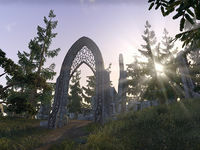 Anga is an Ayleid ruin in northern Cyrodiil, northeast of Bleaker's Outpost. A Dunmer named Brelynd Verano is attempting to enter the ruin with her assistant, Enak. Their attempts are unsuccessful. Anga also appeared in Oblivion.